Fusion is the process that powers the sun and stars. The form of fusion we study occurs when two atoms of hydrogen fuse to form an atom of helium, releasing some of hydrogen's mass as energy. To overcome repelling forces, hydrogen atoms must be heated to extremely high temperatures until they lose an electron and become plasmas. The atoms must also to be held together long enough to fuse. While the sun and stars achieve this with gravity, scientists use several strategies to heat and confine atoms to the degree required for fusion. Although we are likely decades away from relying on fusion as a large-scale energy source, it has numerous advantages over fossil fuels. The elements required for fusion are naturally abundant - one gallon of fresh or ocean water has the energy content of 300 gallons of gasoline. Fusion does not produce greenhouse gases or other combustion byproducts harmful to the environment. And well-designed fusion reactors do not produce unsafe radioactive materials. 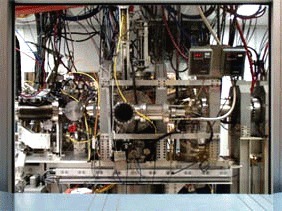 The PISCES program is supported by the U.S. Department of Energy Office of Fusion Energy Sciences. Our team studies how plasmas found in fusion energy systems interact with the material walls of plasma confinement devices. We use state-of-the art facilities and diagnostic techniques to assess the performance and longevity of the plasma-facing materials. This research is critical to the success of the International Thermonuclear Experimental Reactor (ITER), a worldwide project to make the first power producing fusion energy system. Magnetic confinement systems approach fusion power generation through magnetic fields. In this process, a plasma of light atomic nuclei is heated and confined in a tokamak, where it is controlled with strong magnetic fields. The Center for Plasma-Surface Interactions seeks to understand how material surfaces and plasma affect each other in a magnetic fusion device. CER collaborates with MIT and the University of Tennessee within this project, which is sponsored by the US Department of Energy. 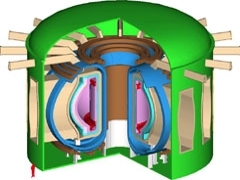 The ARIES program performs conceptual design studies for future fusion power plants. They simulate their operation in order to 1) explore their economic, safety, and environmental implications, 2) establish advantages and disadvantages of different systems, and 3) guide future research and development. ARIES is a national effort led by members of CER, with collaboration from national laboratories, industry, universities, and international organizations. 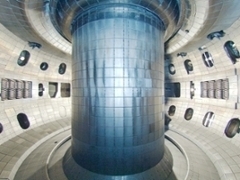 Inertial Confinement Fusion (ICF) is one of two major routes to releasing energy by the process of nuclear fusion for energy generation purposes. Nuclear fusion is the process that provides energy for stars in which two light nuclei join (or fuse) together. The initial mass of the two particles which fuse together is greater than the mass of the product. This small difference in mass is converted into energy in accordance with Einstein’s famous relationship E=mc2 and is eventually released to the surroundings, where it can be captured to generate electricity. We are located in SERF 209, directly East of the Price Center. We also have offices on the 4th floor of EBU-II.